Fish always pairs well with root vegetables, and turnips are a great low-carb alternative to starchy potatoes. Rich in omega-3 fatty acids, grilled salmon is a decadent treat and a great low-carb protein. And since this recipe uses the magnesium-rich turnip greens as well as the root, you can keep your shopping list simple and your body strong and healthy. Chop the greens off of the turnips, wash, and set aside. Cut the turnips in half and sprinkle with salt. Put in a roasting pan with a little water or vegetable stock, cover, and bake for 20 minutes, or until tender. Add the greens to the roasting pan, and roast for an additional 2 minutes until they wilt. In a small bowl, combine parsley, capers, lemon juice, and olive oil to make vinaigrette. Brush the salmon lightly with olive oil and season with salt. Grill for 3-4 minutes per side, depending on thickness, and desired doneness. 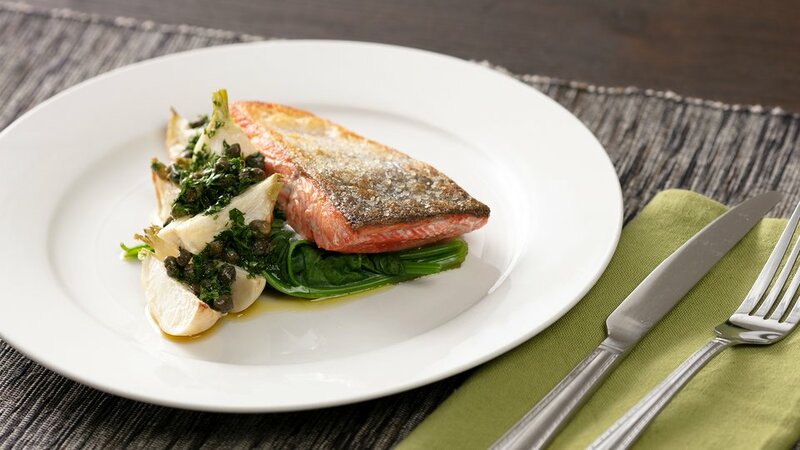 Serve salmon with roasted turnips and drizzle with the parsley caper vinaigrette.